Monjasa today has announced the expansion of its bunker supply locations to Djibouti, Northeast Africa. The new supply location is fully operational and offers all fuel grades according to ISO 8217:2010 specifications. The operation is expended to provide some 200,000 mt of volume. “The objective is to challenge status quo and provide a valid alternative to the traditional Suez and Jeddah bunker markets,” Monjasa said. Located at the mouth of the Red Sea, Monjasa says Djibouti is fast developing into an attractive bunker destination, with Improved maritime infrastructure and heavy investments in port developments all expected in the future. 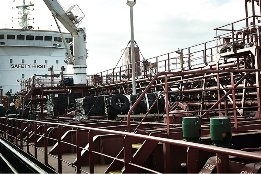 The setup sees Monjasa import products with Handysize tankers, which also serves as floating storage for the operation. It is currently using the 40,000 DWT tanker Karen Maersk. "As the security situation in the Gulf of Aden is improving, new opportunities arise for both service companies and global shippers operating in the area. Having joined forces with a local partner, we are determined to demonstrate Djibouti as a competitive and high-quality refuelling option on this important sea route," says Group COO, Svend Mølholt. Along side the news, Monjasa also announced trade finance bank, UBAF, as new a regional banking partner as part of its Northeast African operations.